International Building & Construction Trade Fair (CBD-IBCTF (Shanghai)) will open on March 23, 2016. This year's exhibition with the theme "big doors & windows, major customization" will thrive to provide comprehensive solutions to the building and construction industry and offer three main functional advantages. International Building & Construction Trade Fair (CBD-IBCTF (Shanghai)) will open on March 23, 2016 to provide comprehensive solutions to the building and construction industry and offer three main functional advantages. The first advantage of CBD-IBCTF (Shanghai) is its platform. With rich resources to the industrial bases in Shanghai and surrounding cities (Yangtze Delta) as well as huge market demand in China, the fair takes advantage of the "three golden months" in building and construction industry .A professional, large scale and comprehensive building and construction exhibition will be created. 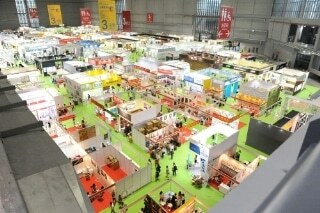 The second advantage is the fair's large number of participating exhibitors. In 2016, about 400 brands and companies from home and abroad gathering in Shanghai will showcase not only their products, but also new ideas and concepts. Furthermore, the 2016 CBD-IBCTF (Shanghai) with a "crossover customization" theme will be a stage for exhibitors to showcase the latest products, designs and technology to the public. An art exhibition will be held during the fair to present excellent design works in Chinese building and construction industry. There will also be over 30 forums and seminars this year that will invite industry professionals, experts and designers to join discussions focusing on trendy topics such as smart home, transitional development,in-depth discuss the new consumptive trend of environmental protection, sustainable development, low carbon, etc. "This year's fair is our fresh attempt with the hope of forging the CBD-IBCTF (Shanghai) into a real international, high-end oriented and platform-based industry benchmark," said LI Deying, general manager of CBD-IBCTF (Shanghai), "we chose to host the fair at the National Exhibition and Convention Center (Shanghai) for the reason that the city has a wide international influence, and we are confident to say that all audiences participating in the fair will find it rewarding and unforgettable experience." International Building & Construction Trade Fair 2016, also referred to CBD-IBCTF (Shanghai), will open on March 23, 2016 at the National Exhibition and Convention Center (Shanghai) to March 26. As one of the biggest and most important building decoration exhibitions in China, the 2016 CBD-IBCTF (Shanghai) will cover an area of 100,000 square meters, gathering 400 exhibitors. The fair is expected to receive 30,000 audiences in 2016.